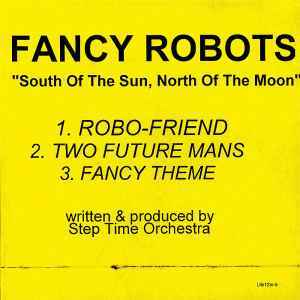 Step Time Orchestra ‎– Fancy Robots "South Of The Sun, North Of The Moon"
The tracklisting used for this entry is the one on the back of the sleeve which seems to be correct. Two Future Mans was and still is an instant classic. Such poetry has seldom been seen since. Robo-Friend awesome Vocoder electro that is really memorable and sticks in your head for days. Great stuff.